27 December 2017, New Delhi: The Supreme Court last week said that restaurants cannot be forced to sell water bottles at MRP as they also render a service along with it and cannot be governed under the Legal Metrology Act. 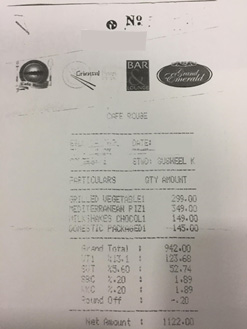 This came after the Ministry of Consumer Affairs recently told the Supreme Court that over charging for pre-packaged products was an offence under the Legal Metrology Act. To understand what consumers think of this and to find a solution, LocalCircles conducted a 6-point survey which received around 45,000 votes. 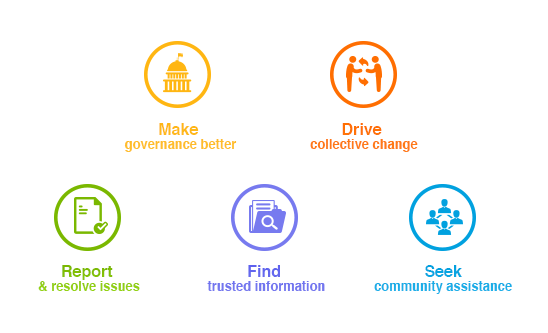 Over 15,000 consumers from 200 cities participated in the survey. 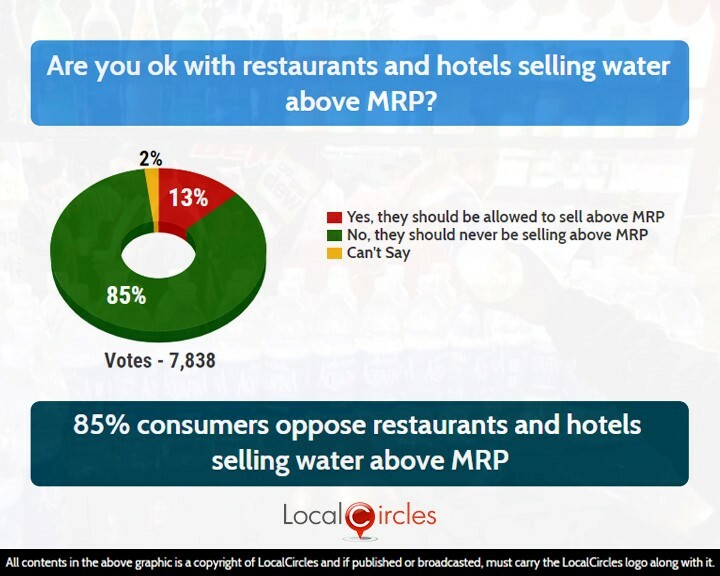 The first poll asked consumers if they were okay with restaurants and hotels selling water above MRP. In response, 85% citizens said they should never be selling above MRP and only 13% said they should be allowed to sell above MRP. In a related poll conducted a few months back, 66% of the consumers that participated had said that they have paid more than the regular MRP for a water bottle at a restaurant or hotel. Out of the 8197 citizens who participated, only 8% said that the bottle had a regular MRP and they were billed for MRP only. 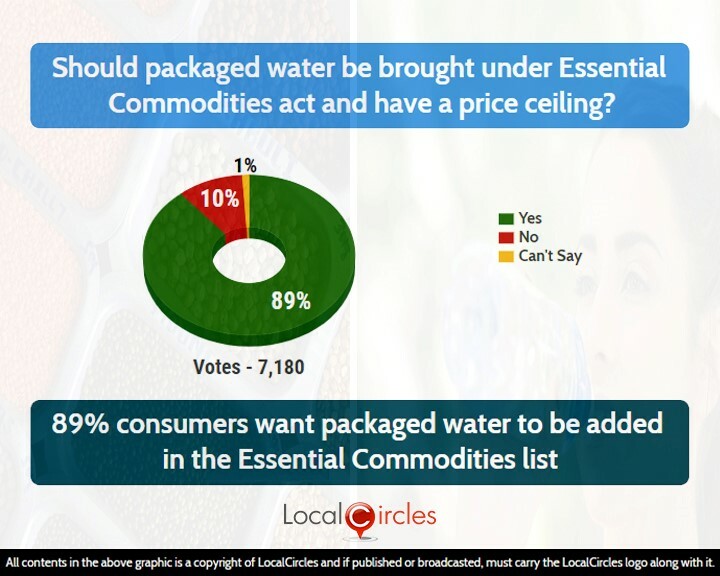 In trying to find a solution to the issue, consumers were also asked if packaged water should be brought under essential commodities act and have a price ceiling, to which 89% respondents agreed and 10% disagreed. 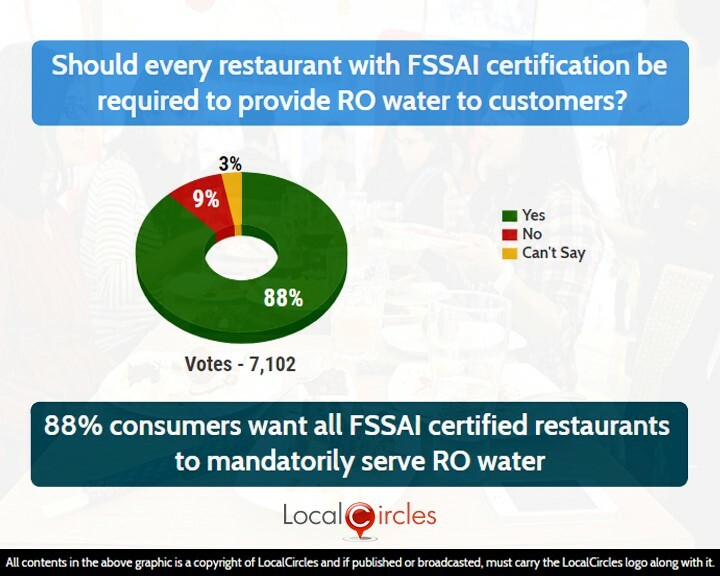 The following question asked if every restaurant with FSSAI certification should be required to provide RO water to the consumer. In response, 88% replied in an affirmative while only 9% replied in a negative. 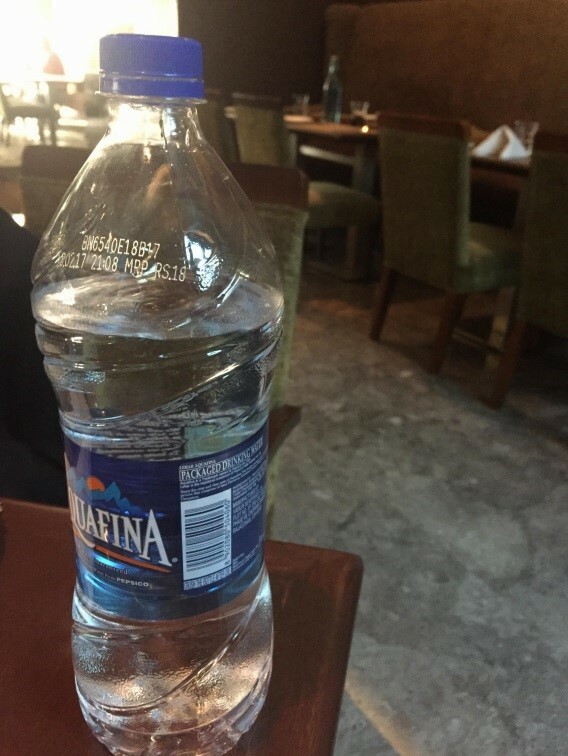 Many restaurants serve normal water to customers but that is not necessarily RO water of safely drinkable water. FSSAI will have to issue direction to install RO filters at all accredited restaurants. They will also have to push them for regular maintenance of the RO system. Consumers have reported many instances where they were charged above MRP for a bottle of water. One of the many incidents as reported by a consumer on LocalCircles is mentioned below. 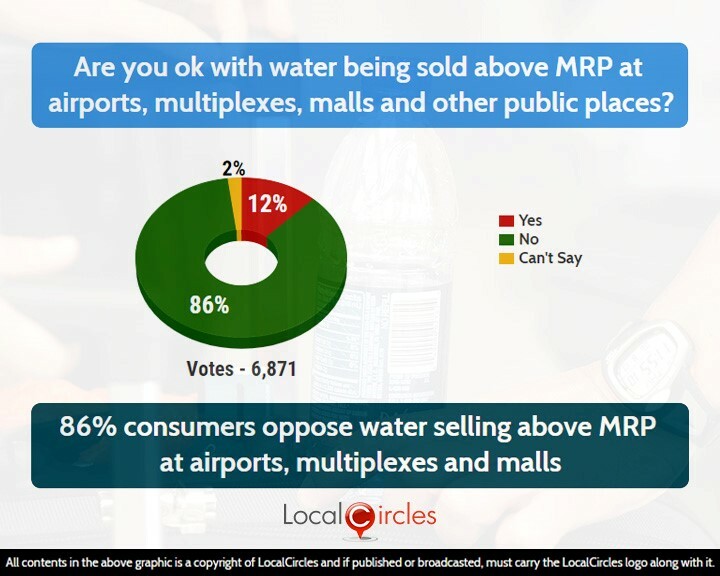 86% consumers in the next poll said they were against water being sold above MRP at airports, multiplexes, mall and other public places. Only 12% said they were fine with it. 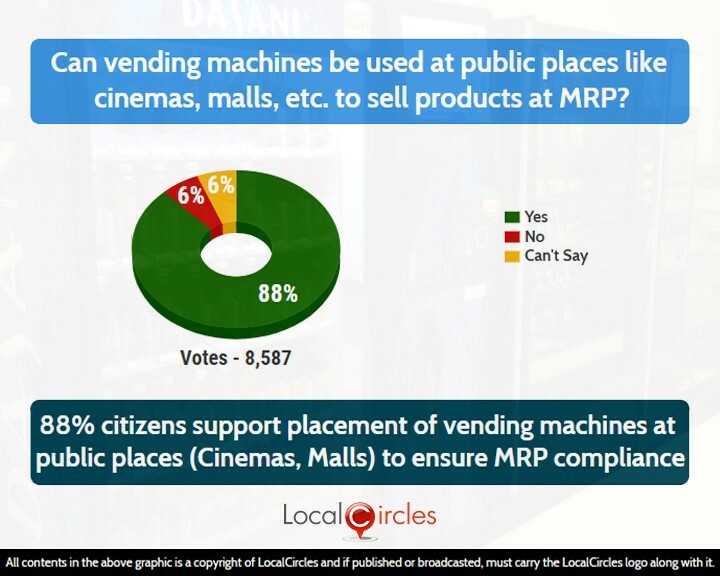 When asked if the placement of vending machines in public private spaces could be a solution to ensure MRP compliance, 88% consumers supported it, 6% did not support this move and another 6% did not have an opinion on it.